Last week, FIRE’s Mary Zoeller caught up with Chris Ferguson, professor of psychology at Stetson University, to discuss his university’s recent adoption of a “Statement of Principles of Free Expression.” Stetson began the process of adopting a statement on free expression back in 2017, when its president convened a task force composed of faculty and staff. After gathering input from a variety of campus stakeholders, the final statement was approved by the Board of Trustees earlier this year. With its adoption, Stetson joins 58 other university and faculty bodies that have adopted free speech policy statements in the model of the “Report of the Committee on Freedom of Expression” at the University of Chicago (the “Chicago Statement”). Professor Ferguson, an alumnus of Stetson himself, was inspired to advocate for the university’s adoption of a free speech statement due to his passion for the university and for free expression generally. You can read our full interview below. Mary: Why did you become involved in the efforts to have a free speech policy statement adopted at Stetson? How did your perspective as a professor and alumnus motivate and influence you during this process? Professor Ferguson: As with a lot of folks, I had become concerned with events on other campuses where it appeared that administration and/or some students and faculty were involved in events that chilled speech. 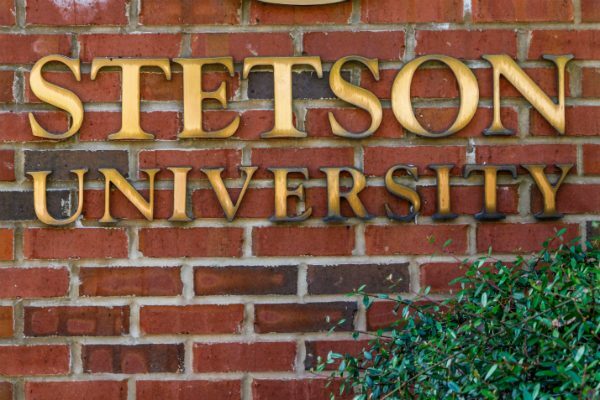 Fortunately, we hadn’t had anything like that at Stetson, but it seemed the time was ripe for Stetson to take a clear stance affirming our commitment to free speech and academic freedom. I’ve been involved with the Stetson community for a long time, going back to being a student in 1991, and I felt it was important for our community to be clear in its support for this fundamental component of civic responsibility and free inquiry. Mary: What did you and your colleagues hope to accomplish by advocating for, and eventually adopting, this statement? Professor Ferguson: I think we wanted to make our value of free speech abundantly clear to our community and the larger public. As academics we tend to take free inquiry for granted, but some recent events have highlighted that it can be easy to see it erode if we’re not careful. With this [statement], our commitment to free speech is very clear. Mary: You were highly involved in advocating for and drafting this statement. What different approaches were considered? Why did you want the university, and not just the faculty, to endorse such a statement? Professor Ferguson: I think a lot of different groups, from the university president Wendy Libby to many of the faculty, saw this as an emerging issue for academia. Like most universities, we obviously prefer dialogue that is civil and respectful, and certainly free of deliberate racism, sexism and other nastiness. But at the same time, we need to be sure that we maintain an environment of open inquiry even where dialogue may be challenging, difficult, or even offensive to some. I think as different folks started thinking about this, we weren’t quite sure what the best direction might have been. We had the good fortune of having a president who was on board with this and a presidential initiative ultimately led to our statement being approved by the Board of Trustees, which is as good as it can get. We had a lot of folks working on this and a lot of great community input so this really was an excellent community effort. Mary: The statement eloquently describes the value of inquiry and debate, stating “[t]he best insights are achieved through dialogue which is civil, intellectual, and respectful of differing views. Nevertheless, without protection for expression that might be deemed objectionable, offensive, or challenging, free expression as a value has little meaning.” What does this mean to you as a faculty member? Professor Ferguson: I think one of the concerns we had was the concept of chilling [speech]. We’d seen research reports as well as anecdotal stories of students and faculty worrying about the repercussions of raising controversial views or topics, even if doing so in good faith. We wanted it to be clear that our university supports these challenging intellectual dialogues. I think we clearly prefer dialogue that is respectful and constructive, but we also acknowledge that free speech means offering protections for speech we may not always like. Mary: What was the biggest challenge you faced during this process? Professor Ferguson: I think again, the challenge was in making it clear that we support a pretty wide platform for open inquiry and free speech without appearing insensitive to concerns among some students regarding hateful speech. I imagine that’s the struggle for a lot of schools…we want both free speech and respectful speech, so how do you get both of these at the same time? I think attempts to regulate speech can easily backfire and cause more problems than good, and that respectful speech can often be fostered by example rather than by decree. Hence we have initiatives such as “Unsafe Spaces” where contentious topics can be discussed in a respectful and constructive manner. Mary: What was the most agreed upon aspect of the statement? Professor Ferguson: I think overall, we agreed we needed to make a clear statement affirming free speech as a central value for the university. Mary: What did you learn about the value of debate and discourse during the campaign to adopt a free speech policy statement at Stetson? Professor Ferguson: Well, it can be intimidating to create an idea and release it to the larger community to evaluate. We got a lot of great feedback, very helpful, and I think that process really helped us to shape a quality final product. Professor Ferguson: I think we all believe we’re advocates for free speech and that’s easy for speech we like. It can be hard to defend speech we don’t like though, but that’s necessary to be an advocate for free speech. I think for academics thinking of working on something similar at their universities, this is a very worthwhile undertaking. It can start with a single professor or student…advocate with the dean, the provost or president or anyone who will listen!